This adorable new show certainly charmed our KIDS FIRST! reporters. It follows the life of the adorable Lily, a five-year-old who lives with her dad and she creates a cast of characters in her imagination that live in Driftwood Bay. Lily’s imagination is quite the thing. Every day, she finds a new treasure on the beach which sparks her to create interesting things. Accompanied by Gull, the clever seagull, a new adventure begins as they go across the way to Driftwood Bay. KIDS FIRST! Film Critic Morgan B. comments, “Ah, to sit and look out over the sandy beach at the ocean every day, then your pet gull cries out, “Look, look!” and you spot something buried in the sand.” Jasmyn D. adds, “Lily’s Driftwood Bay is a cute and adorable show that all children will love! The animated characters are so cute because they look like a child colored them. Lily’s character is very dainty and her personality is as bright as the sun.” See their full reviews below. Ah, to sit and look out over the sandy beach at the ocean every day, then your pet gull cries out, “Look, look!” and you spot something buried in the sand. Every day is a new find and a new adventure for Lily who leaves the world and goes off into her imagination to Driftwood Bay, an adorable little place for her to play and discover a use for her new treasure. The cast of characters are unique, cute and quirky, looking just like something a child would dream up. It includes Captain Salty, the dog with a sailing ship. Bull who is made from messy balls of string and squeaky mice. Lord Stag is a puffin. Hatsie is the train conductor and we meet lots of whales. Lily, with her red hair and a cute Irish accent looks like a paper doll and is my favorite character. I love how she can take a small found object from the beach and think of so many different uses for it. Then, it is turns into a grand adventure. I laughed so hard while watching the episode Bulls Might Fly. Lord Stag and Bull actually try to hang guild. Everyone has doubts, but you are in for grand and shocking surprise. It shows that even though you might be afraid to do something, it doesn’t mean it can’t be fun. The lessons learned in these fun stories are easy for young kids to understand. Lessons such as, you should tell the truth. Even if you break something, you can get help in fixing it. A boat is too big to fix by yourself. When you lose something, it is easier to find with help from others, especially if you can’t sleep without it. You should always apologize if you are wrong. Friendship is important. Be creative and use your imagination. Always put things back where they belong, so you can find them later. This collection of short episodes is perfect for children as young as two. They are only ten minutes long and are quite easy to follow. I enjoyed watching all ten episodes, but I was just getting into them when they ended. For older kids, they may be too repetitive because the beginning and the end are the same in every episode. I recommend this DVD for ages 2 to 7 and give it 4 out of 5 shining starfish! 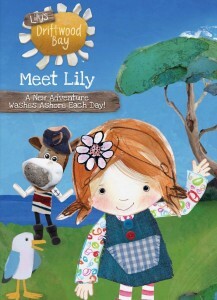 Lily’s Driftwood Bay is a cute and adorable show that all children will love! The animated characters are so cute because they look like a child colored them. Lily’s character is very dainty and her personality is as bright as the sun. She seems so outgoing and loves an adventure. The opening captures your attention immediately where you see Lily making things out of objects she finds at the beach. This season contains ten episodes and runs approximately 75 minutes long. Lily’s Driftwood Bay is a Northern Irish children’s television series that premiered on Nick Jr. in the UK and Ireland in 2014. Creator Colin Williams really has made something special that I truly believe children will love as they follow Lily on her fun adventures with her friends Gull, Salty, Hatsie and more. Every day the sea washes up a new treasure which sparks Lily’s imagination about what might be happening on Driftwood Bay. The voice talent also excels. Orlagh O’Keefe is the voice of Lily. Peter Mullan voices Salty the dog. Paul Currie is the voice of Gull. Tameka Empson voices Hatsie the Hen. Many of these voice over actors have been in major movies or TV shows. Peter Mullan appeared in Hercules, The Jungle Book, Harry Potter and War Horse. Paul Currie is best known for Big City Park and Big and Small. The show is very interactive and well suited for its audience. My favorite scenes in the show are when Lily comes back with new things. It’s not a show I would watch and I’m a teenager and it’s more suited for kids ages 4 to 7. I rate it 4 out of 5 stars and think that girls will like it more than boys since it is a bit girly. The DVD is available now so, go check it out. Based on the supremely popular stories by Soviet science fiction writer Kir Bulychov, Alisa Knows What to Do is a 3D series produced by Russian studios and now available in the U.S. on DVD from N Circle Entertainment. The stories follows the incredible adventures of 12-year-old Alisa Selezneva and her friends in the late 21st century. KIDS FIRST! Film Critic Gerry O. comments, “. It is exciting to see a very unique style of camera shots and coloring. On top of that, the English dubbing is exceptionally well don and very smooth. I didn’t even realize that characters were re-voiced until the second episode.” Morgan B. adds, “Their adventures have many learning lessons including: The power of friendship is greater than anything; You should not judge people or animals based on their looks; Personality and true hearts are better traits then just good looks.” See their full reviews below. There are so many great Sci-fi movies and TV shows out there. However, very few of them are meant for kids or are poorly done. Well, Alisa Knows What to Do!, is a beautifully animated and exciting Sci-fi series distributed by N Circle Entertainment that is great for kids and adults. Each episode is a separate adventure featuring middle school student Alisa and her friends filled with action and even some fun teenage romance. All the stories are kids friendly and yet, contain original humor that adults will appreciate too. Add to that some stunning animated visual effects and it makes it for a great show that a wide audience will enjoy. Alisa is a young girl living many years in the future. The show follows all her crazy and fun adventures with her family and friends and involves animals and technical gadgets that we hope to have in a future. Additionally, each episode delivers a positive moral story which is nicely portrayed nicely within the show itself. The show stays exciting with fun adventures. If you are a fan of science fiction or enjoy dreaming about the future possibilities like I do, you will enjoy this show where we see lots of technology such as space jumpers, hover boots and even cloning! 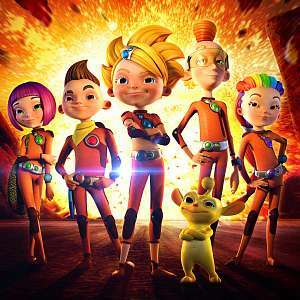 The Russian-produced show is produced by Timur Bekmambetov’s Bazelevs Group, Riki Group and Animation Studio Moskva. It is exciting to see a very unique style of camera shots and coloring. On top of that, the English dubbing is exceptionally well don and very smooth. I didn’t even realize that characters were re-voiced until the second episode. The series is based on the books by Russian science fiction author, Kir Bulychiov. For people who have read his books, as my family did for many years, it is cool to see the characters come to life. However, the stories are original to the show, which allows even readers of his books to be surprised. My favorite episode is Wipe Out Creativity in which a few of Alisa’s friends sign up to take implants to make them smarter and stronger. However, they get in trouble and Alisa and some of her new friends rescue them. I love this episode because the subject is very interesting and starting to come up in today’s world. The moral of it is: Don’t let others mold you; only you can make you. I think that is very important and agree 100 per cent. The show is designed for young kids. A few parts may be a bit intense so, I recommend it for ages 7 to 18. I also give it 5 out of 5 stars because it is beautifully animated, has an exciting story, impressive voiceovers and original comedy. Welcome to United States, Alisa Selesneva – kids here are going to love you! I found this DVD to be unique and interesting. This four episodes tells all about Alisa and her four teenage friends embarking on many adventures. The first episode focuses on an adorable creature called a Truenox. It is original, funny and quirky with the added bonus of having many mysteries to solve. It was very enjoyable to watch. My favorite episode, A Singing Showdown has a mystery and a shocking outcome. Hilariously funny with great music, this show down wants to see who will rule the planet. The colorful characters resemble real teenagers. Real geniuses who think outside of the box, they create new and cool ideas to save people, creatures and their planet. My favorite character has to be Alisa because she shows girl power, humor and potentially your best friend. She rises to the occasion whenever danger lurks. The voiceovers actors truly match the emotions and voices of real teenagers. Each character has its own unique voice and characteristics, which match their avatar. This makes the film very believable. The Truenox, which they rescue in the first episode The Mysteries of the Last Truenox, has to be the cutest pet that I have seen. I could hug it for days. He turns out to be an alien that helps Alisa and her friends on their adventures. Comical almost to a fault, he adds humor to the series which made me laugh a lot. Just one smile from him and I found myself smiling back. Their adventures have many learning lessons including: The power of friendship is greater than anything; You should not judge people or animals based on their looks; Personality and true hearts are better traits then just good looks. The colorful animation has amazing details. I felt as if I was living in the future. I could actually imagine living on this futuristic planet. The animated people feel like they are real. I found this an amusing place that I would enjoy being a part of. Flying cars and boots would be amazing to own. The unusual design of the different gadgets and modes of transportation add to the futuristic feel of this movie. All of the space aliens look peculiar and plausible. I recommend this film for ages 6 to 15 because of its cuteness, bright animation and easy to follow storyline. I give this movie 5 out of 5 galactic stars.